RapReviews.com Feature for November 24, 2015 - J-Live's "How Much Is Water?" 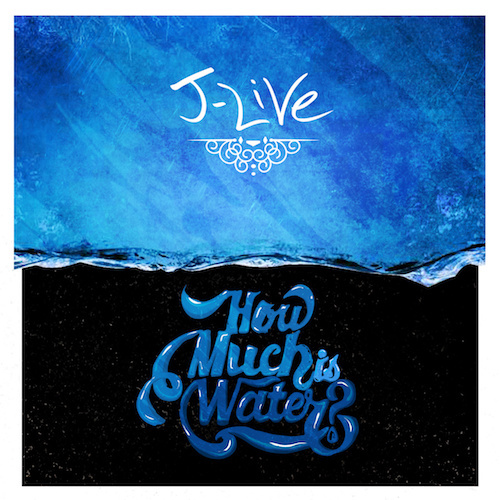 J-Live :: How Much Is Water? must have never made art for a living..."
Intimately familiar with the meaning of those lines, Jean-Jacques Cadet has been making art for a living since the mid-1990's, rapping with the nom de plume J-Live. It's awfully cliche to say a fine wine only gets better with age, but the good news is that J-Live doesn't rely on the same literary crutches I do as a writer. I'll go ahead and get my lean on though because whenever my faith in hip-hop is tested, I know that J-Live can answer those questions with almost any album from his two decade catalogue. He's a certified triple threat in hip-hop who handles every aspect of his album other than the cameo verses, and while other people would wilt under that much weight J rises to every single occasion. It's no coincidence he quotes from a famous philosopher in his liner notes. "Without music, life would be a mistake." - Friedrich Nietzsche. Every aspect of J-Live albums is meant to challenge your preconceived notions of what rapping can be, is and SHOULD be. He's not simply making clever songs to stroke his own ego, or for how many zeroes it can add to his bank statement, or for the adoration and praise of fans and critics worldwide. There's no doubt he can achieve all those things in any endeavor in or outside of rap given how hard working and talented he is; instead J uses his gifts to give them right back to the listeners whether they wanted an early birthday or not. One can listen to a J-Live album on a completely superficial level and still enjoy the quality of the beats and rhymes, but the moment the listener pays attention to songs like "Ya Momma So Black" his truly radical approach to making music that matters shines through. into this world she might have tried to warn you"
This isn't J-Live was trying to diss The Pharcyde, despite the fact their first hit single was based on the very phenomenon he's decrying right here. (In truth why would he bother? Their career peaked and went into decline right as his started.) Rather he's calling into question why it's considered perfectly acceptable to mock mothers so brazenly, when it takes a strong black woman to give birth to and raise a nation of millions that can't be held back. "If anybody try to play the dozens like that, they need to be smacked." J has no ulterior motive here. He's not teaching a classroom full of eager students who would admire his feminism - but if you've ever made a momma joke you might just feel schooled. Remember that J is self-produced, self-recorded and self-published when considering this song. He's saying exactly how he feels about exactly what he wants, whether you agree with him or not. In case you got it twisted, J is not dropping an album full of high minded ideals, because he's not on a pedestal holding tablets like the rap Moses. It's not that he couldn't lay down law any time he wanted, but he's as human as any of the rest of us, and occasionally he wants to lay down the pipe too. J's appeal to the ladies isn't based on his rapping prowess, bank account or good looks - though no doubt he has all of those in equal measure. (Well the bank book couldn't probably be fatter for an indie rapper but that's neither here nor there.) It's his playful humor that will really make women wetter than the "Water" in his album's title, as evidenced by songs like "Got Me Thinking." Them other brothers ain't wrapped too tight huh? Shall I pull your hair and spank you? +Slow Down+, a little too quick to be in"
What's even more incredible to me is how he constructs the entire second verse around Gang Starr references (R.I.P. Keith Elam) while still managing to keep his sexually playful attitude toward the object of his affection in the song. This is what J-Live has been known for his entire career. He might slyly claim to not care about the details while he's macking, but few rappers put as much time and effort into making songs for hip-hop fans, from a clear fan of the artform himself. Listening to J-Live is like going to a movie theater for the latest Marvel flick - you know they're going to reference other characters you love whether they are seen in the movie or not, and you know you're going to get that Stan Lee cameo too. It's entirely obvious it's going to happen, and you're not mad when it does - you're pleased that they care enough to address you as a fan and give you just what you wanted. f--k all that revisionist history! The court's fulla killers with flows that might drown 'em"
Did you expect the KRS-One sample based on the title of this song? Yes. Did it take "Kings Just Rule" down any once he delievered it? HELL NO. The fiery bars that J-Live spits on this track are pleasantly reminiscent of Black Thought, or perhaps vice versa given they are each serious about their craft and skilled at creating music to showcase it. There's a passion for hip-hop here that shines through in each and every bar that simply can't be found in most of your your favorite commercial rappers no matter how good they are. J raps like he's still HUNGRY, spitting with the passion of a man half his age who doesn't have triple the workload of other emcees who don't produce and deejay their own s--t. Through it all he remains humble and grateful to be in the position he's in, which may be his greatest asset of all given the way we writers tend to gush about the quality of his work. Whether he had one fan or a million I have no doubt Jean-Jacques Cadet would still be live as f--k and still order a glass of water with each meal.